What happens when you put two vampire novellas in the same book? 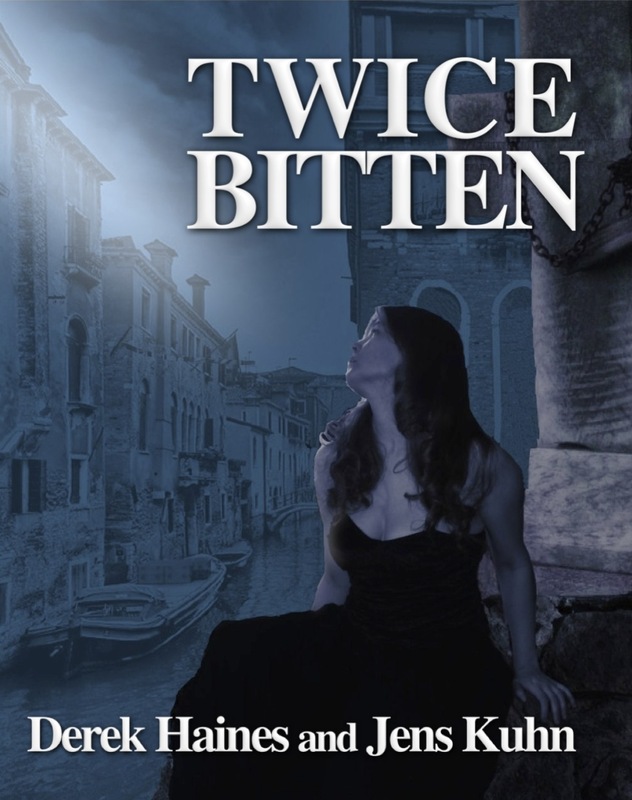 Twice Bitten is a collection of two charming novellas, both centered around a female vampire. In Escape in Venice by Jens Kuhn we meet Antonia Correlli, a relatively young vampire who still learns to master her special abilities as a succubus. As such, she does not only feed on blood like ordinary vampires, but can also feed on humans’ sexual passions, draining them of their energy and powering her unique abilities. Antonia is invited by her incubus friend and mentor, Count Emilio, to 18th century Venice in order to help him with a delicate matter, a young lady the count desires, but who does not respond to his incubus magic as she should. Antonia, tasked to find out what makes this woman resistant to the count’s advances, must learn to master her own magic as well as find a way to save his friend’s beloved one from a great danger. The second novella, My Take Away Vampire by Derek Haines, takes us back to modern times and a forlorn town that does not hold much excitement for the teenage kids living there. If it weren’t for Agatha of course, the pretty vampire who roams the night, finding her prey on deserted roads, graveyards and, of course, the local night-open fast food restaurant. Agatha, kept sane by her cheerful ghost friend Mr. Fipps, struggles to avoid becoming too attached to her source of food, knowing that falling in love with a human is rarely a good idea. While living in different times and facing different problems, Antonia and Agatha have a lot in common. Neither of them is evil even though they accept that killing is a part of their nature and something that isn’t easily avoided. Antonia and Agatha have been around for over 300 years and each have their own unique ways of dealing with their immortality. From the romantic canal-ways of the Venice of the 18th century, to the modern, industrialised wasteland of a small forgotten town. Follow their stories to discover that you can’t always believe everything you thought you knew about vampires. "Antonia shivered. It was getting cold and dark, perhaps this wasn't the best idea. After all, she was still starving. Suddenly, she made a decision. Turning around, she put her hand onto the gondolero's bare arm and dropped her shields." "Agatha now waited patiently – whiling away her time – but sensing her deepening hunger. ‘Young blood’, she mouthed silently to herself as she felt the twinges of her anxious fangs." Twice Bitten is available in Paperback and for Amazon Kindle.